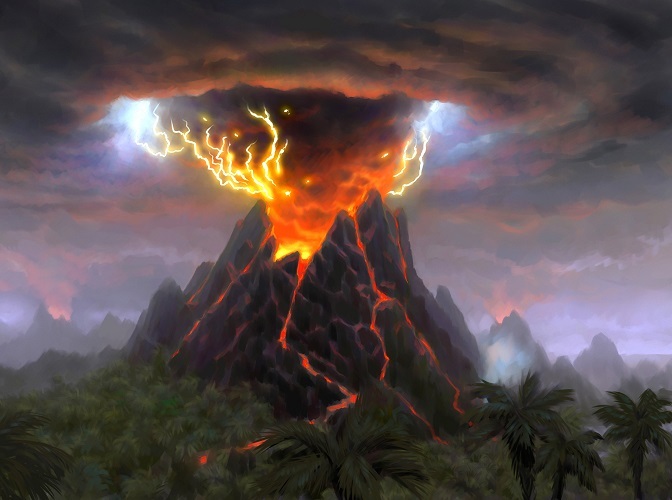 Born in violence and ending in utter destruction, volcanoes are among the most destructive natural disasters known to man. They have within them the power to cause earthquakes, tsunamis, famine, and volcanic winter. Volcanic Eruptions are measured using the VEI, or Volcanic Explosivity Index. This takes into account a number of factors, including the volume of debris emitted into the air and how high the eruption spews into the heavens. Similar to the Richter Scale, each point in the VEI increases 10-fold in power. In other words, an eruption measuring VEI 2 would be ten times larger than one that measured VEI 1, and one that measured VEI 3 would be ten times larger than one that measured VEI 2 … and so on and so forth. And now, in ascending order of destruction…. Mount Kelud Volcanic eruption of 2014 in Java, Indonesia. Source. Mount Kelud is one of the most active volcanoes in Indonesia, erupting over 30 times in the last 600 years, and claiming over 15,000 lives. The volcano is located on the island of Java, home to over half of Indonesia’s 240 million population. 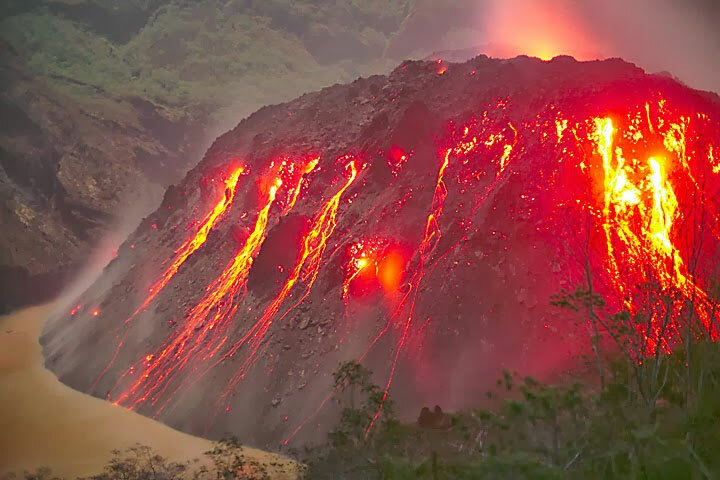 It’s earliest recorded eruption was in 1334, while the most recent eruption occurred on February 14, 2014, whereby 3 were killed and over 200,000 evacuated. In 1919, a powerful explosion was heard over 200 kilometers away. In just a few seconds, the massive eruption ejected 38 million cubic meters of water from its crater lake. This produced a lethal “lahar” or mudflow, which travelled 40km, destroying 100 villages. After the eruption of 1919, volcanological authorities devised a way to drain the crater lake, thus reducing the threat of hot mud flows in the future. 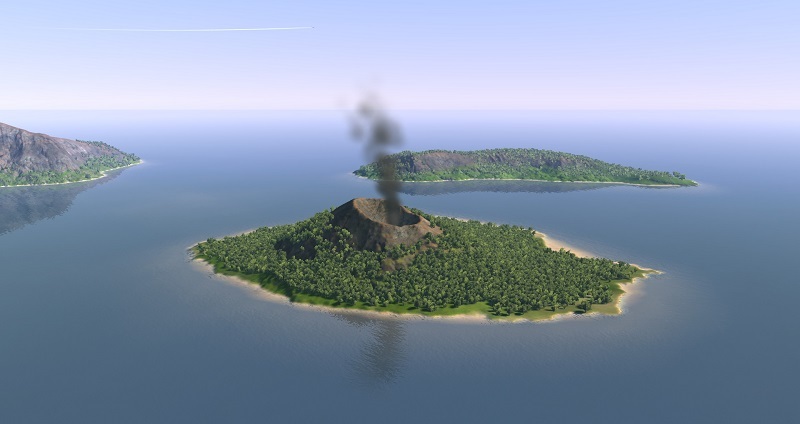 The remains of Krakatoa Island, which once measured about 45 square kilometers. Source. 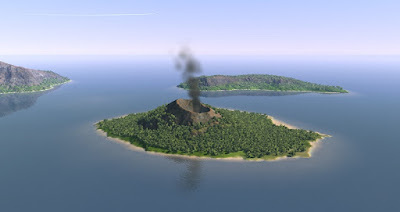 Mount Krakatoa is probably one of the most famous volcanic eruptions, and among the deadliest in modern history. Due to the recent invention of the telegraph, it was the world’s first globally documented disaster. As with most cataclysmic eruptions, Krakatoa lay dormant for 200 years before the devastating event. On August 26, 1883, Krakatoa erupted in a series of explosions so loud, they were heard 3,500km away in Australia and 4,800 km away on Rodrigues Island. Superheated ash rained down over the islands of Java and Sumatra, claiming 1,000 lives. The ash filled the sky as far as Singapore, thrusting the Sunda Straits into darkness for a full 18 hours. The explosion caused a chain reaction of earthquakes, followed by 40 meter high tsunamis. The enormous waves rocked ships as far as South Africa, and of course those closer were not so lucky. Entire islands were overwhelmed, 165 coastal villages destroyed, and over 35,000 lives lost. The final eruption blasted through the walls of the volcano, completely destroying the island on which the volcano sat. The volcano is still active, and has resulted in the birth of a new volcano: Anak Krakatau, or Child of Krakatoa. The mountain grows at a rate of 13 cm per year. 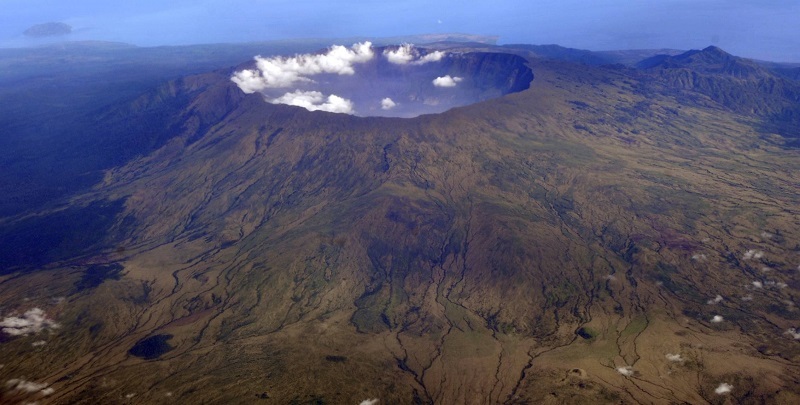 The Tambora Crater, Sumbawa Island, Indonesia. Source. In the 18th century, Mount Tambora would have stood 4,300 meters high – one of the highest peaks on the Indonesian Archipelago. Now, the caldera rests just 2,722 meters above sea level. What exactly does a VEI 7 eruption entail? A volume of at least 100 cubic kilometers of material released and devastating long-term effects on the surrounding area and global climate. Tambora’s thunderous eruption of 1815 was the loudest sound to be recorded in human history, estimated at approximately 320 decibels. To put that in perspective, an Aircraft at take-off measures about 180dB, while sounds approaching 198dB are loud enough to rupture your brain and kill you on the spot. That’s what happened to anyone close enough to Tambora when it erupted. After that, came the ash. Over 10 billion tons of it. The plume rose 40km into the air, reaching the stratosphere. Quickly carried by the wind, ash shrouded surrounding areas, causing darkness over 600 kilometers away. On the island of Sumbawa, about 10,000 perished during the eruption. With crops destroyed and clean water polluted with ash, a further 44,000 would soon be lost to famine and disease. Tens of thousands on the neighboring islands of Lombok, Bali and East Java met the same fate. Unusually cold weather soon hit Europe and the Mediterranean, causing failed harvests, and therefore famine. Frost was reported in Connecticut, and snow fell in New York – in the month of June. Crops perished as North America plunged into a cold summer, followed by the coldest reported winter since the 1400s. Segara Anak, "Little Ocean" crater lake atop Mount Rinjani, Samala's surviving twin peak. Source. Medieval Chronicles of Europe describe 1257 as year of cold summers, failed crops, floods and famine. Thousands were buried in London in mass graves. Ice core archives and tree ring records show one of the largest volcanic eruptions of the last 7,000 years occurred in the year 1257, though the source of this eruption had remained unknown until recently in 2013. According to sulfur and dust traces in polar ice caps, the mystery volcano would have exploded with a magnitude 8 times the force of Krakatoa, and twice the force of Tambora – two of the largest eruptions in our modern history. Various spots around the world had been investigated, before it was agreed that Samala was the cause of the global catastrophe. Indonesian historical records tell of a massive eruption that buried the capital of a Lombok Kingdom before the end of the 13th century. Mount Samala, the former twin peak of Mount Rinjani, obliterated itself during the colossal eruption. Lake Toba, the Super-Volcano's crater lake spans 1,130 square km. Source. The Toba Explosion is the largest and most destructive eruption of the last 2.5 million years, and likely far beyond that. It is one of just 47 volcanoes that have reached the epic proportions of VEI 8, or Mega-Colossal – the largest magnitude on the Volcanic Explosivity Index. Read: Apocalyptic. The Super-Eruption exploded with a magnitude 100 times greater than Tambora, spewing 2,800 cubic kilometers of magma and hot ash into the atmosphere. The eruption would have instantly obliterated all life in its immediate surroundings and caused a 6-year volcanic winter, followed by a possibly millennium-long era of cooling. Calculated numbers are kept to a minimum or underestimation. Research shows that the date of eruption coincides with a sudden environmental shift and the onset of the Last Glacial Period or Ice Age. The date also matches with a genetic bottle-neck that occurred during the same time period, where the human population was reduced to merely a few thousand breeding pairs. The Super-Volcano is survived by its Crater-Lake of the same name, the largest volcanic lake in the world. The Toba Super-Volcano is the largest volcano in the world, with more eruptive power than even the legendary Yellowstone Caldera. In June 2015, after being dormant for 75,000 years, the site has come back to life. Excellent short survey. Well done!